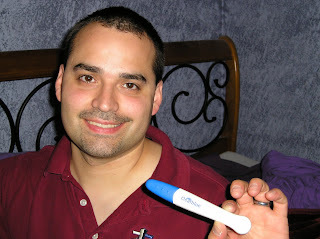 One set of the Ibarra Family: We are going to have a baby!!!!!!! So, to break the news to Tim I put some "daddy" bibs, a sippy cup, and blanket in his sock drawer, because he always changes his socks when he get home before he leaves out again. 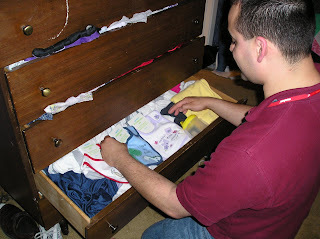 After talking him in to opening the drawer, he said I have already seen these bibs, I was there when we bought them. Frustrated I said, well, I just thought you should get used to your stuff being mixed in with the baby's, still not getting it, I showed him the test, he said I should take another one, just t o be sure, needless to say he finally believed me, and was so excited. 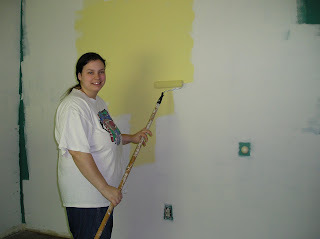 We have already started painting the baby's room yellow, and we have the furniture. Grandma (my mom) helped me with the room. She is just as excited as we are. 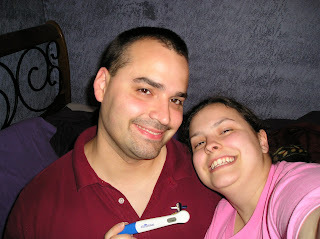 I found out that we are going to have a baby, I guess we weren't too far behind Amber. We are estatic, I already can't wait and I am only 8 weeks and 4 days. Yeah!! I love updates! 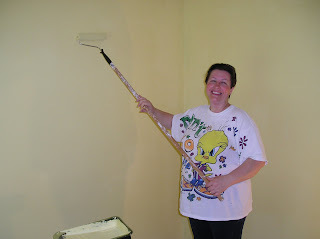 :) Good job painting....let me know if you need any help. I've been known to pick up a paint brush or two when forced. haha Seriously, let me know if you need any help...I'd love to do whatever you'll let me.